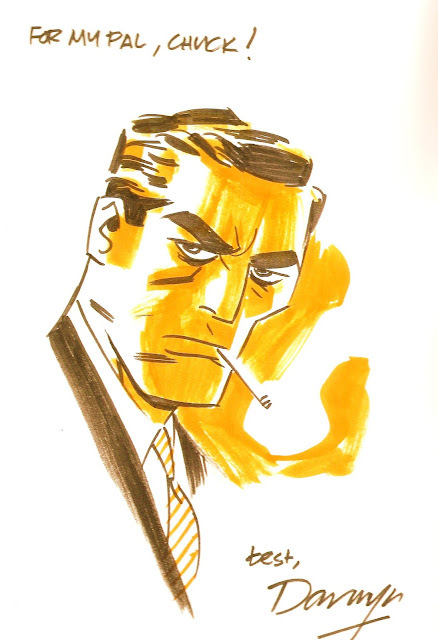 Darwyn Cooke’s passing is a painful loss on so many levels. As a consummate all-rounder in the comics medium, Darwyn was even more interesting as a man than his work. And that’s trumping some damn exceptional work. He came to comics later in his life than most creators. In many ways they were his third act. He led an entire life separate from comics before that and was successful in that life if not happy. In comics he found his joy. In comics he found his place. He worked hard to advance the medium by returning to the basic building blocks of composition, character, pacing, storytelling and that most elusive element in comics today, clarity. He was showing us the way forward by showing us the way back. More specifically he was trying to re-teach those of us who had forgotten that comic books could be a mass entertainment medium powerful enough to engage an audience much larger than the one they have now. His work was always reaching out to engage. And he actively sought ways to increase comic book readership both for his own work and the medium in general. And at most steps he met with resistance. For those of us who actually do the comics, this was always confounding. Here you had a guy showing the way. It was clear to anyone who understands the craft that here was a force waiting to be released. And a guy who had the toughness of mind, force of personality and keen focus to Make Stuff Happen and bring people along with him to new opportunities. Unfortunately, he was seen as a singular talent by the gatekeepers. And he was, and is, a singular talent. His work was no fluke. It was no one-off, lucky day, gathering of the muses. Darwyn had no plans to pat his laurels into a throne and spend a career living off a few remarkable accomplishments. His work was only starting. This guy had the knowledge. He understood, as many creators do, the language of the medium. And he had the sheer force of will to bring his ideas to reality and delight his peers and countless readers. He didn’t want to be a milestone in comics. He wanted to be a ranger leading the way to a larger and larger reader population; to try his damnedest to put comics back into the entertainment mix with every other great American medium. Now he’s gone and all that talent, and power, and skill are gone. The stories he had yet to tell are gone. Those anecdotes he told in the late hours at hotel bars will only be re-told in our memories now. And we will remember them. As we will remember Darwyn. Thanks for your kindness, your toughness and your indelible contribution to the form we love. Thanks Chuck, for saying the words it's been hard to find. Good words Chuck. He will be missed. Good words Chuck. He will be sorely missed.